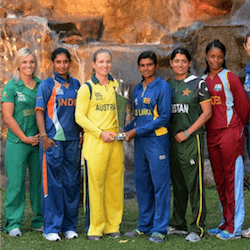 This year’s 2017 ICC Women’s World Cup Qualifier event will be held in the capitol of Sri Lanka, Colombo. The qualifier is running between the 7th and 21st of February. The 10 team tournament will determine which four teams get the final available slots for the ICC woman’s world cup event later in the year. The only automatic qualifier for the finals so far is of course Australia who is the current reigning champion. They will be joined by the teams that have made it through their region qualifier matches. These teams are Bangladesh, Ireland, Papua New Guinea, Thailand, Scotland and Zimbabwe. The remaining spots that will be determined by the 10 team qualifier, with the bottom 4 teams from the 2016 World Cup, Pakistan, India, Sri Lanka and South Africa, needing to make a strong showing if they wish to play in this year’s ICC final. The current top ranked teams are Australia with a clear 36 point lead in the World Cup rankings. They are followed by England with 29 points. This year’s ICC final will be the first time in 20 years that the event is held on UK soil again. There have already been record-breaking ticket sales for the June finals. Chief executive for the ICC, David Richardson has said that it is a clear sign that the public is clamouring for women’s cricket action. The final two teams in the world rankings are New Zealand and the West Indies. Australian team captain, Meg Lanning has stated that she believes their strong batting performance is what is the team’s main strength and their spin bowling helps control games well. She feels there are still areas that the team can improve on before the next World Cup. Meg Lannings team along with a few other players from the English team will be taking part in this year’s Women’s Big Bash League in Australia which both teams will be looking to as a training camp of sorts. Fans are looking forward to this year’s event in the UK due to the great performance of the team’s in last year’s ICC Cup. Australia has a commanding lead but with strong competition brewing in the New Zealand, English and West Indian teams, they will have their work cut out for them in June when they face off against each other in the qualifier.